How Do I Ensure an Employee is Recommended for a Shift? Recommended employees makes is easier to find your best employees for your shifts. To learn how to add specific employees as 'Recommended/Preferred' for a shift, follow our Preferred Employee Guide. Sometimes when scheduling your employees you will see a warning pop-up. This means that an employee is not currently recommended to work that shift. Recommendation is based on five factors which the system will automatically take into account when displaying your employees. The system will check if the employee is already scheduled for another shift at the same time, whether the employee is available (not registered as unavailable or on approved leave), if the employee has the appropriate training, and if the employee has exceeded their recommended weekly hours (their Stress Profile). We'll explain these below. Before selecting an employee you will be able to see if they are recommended for a shift, as shown below. You will see this error if an employee is already working another shift. 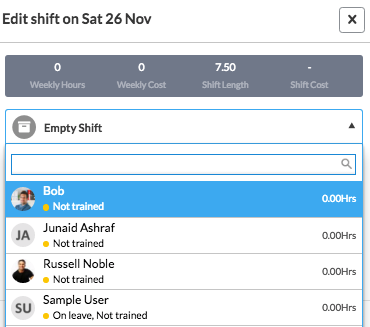 Even if the overlap between shifts is for a single minute you won't be able to schedule the employee on the shift. If you would like to schedule this employee, please either adjust the length of the shift so it no longer overlaps, or remove the employee from the first shift. This is the only warning you may not override, as it is impossible for an employee to work in two locations at once. This error means that the work area you have selected has a training requirement applied to it. The employee you are trying to schedule does not have the relevant training to work in this area. If you have multiple training categories applied the employee requires all of them to be recommended. Assign another employee to the shift. If the employee doesn't have the required training, go to ‘People’ and add the relevant training in the ‘Employee Edit’ pane for the employee (see how it works here). The employee has requested to be set as ‘unavailable’ during this period. Addressing the warning is business process dependant. If an employee appears as "On Leave" it means that they have an approved leave request overlapping the given time period. Override the warning and schedule the employee. Each employee has a stress profile, which controls how many hours they may work in a given day or week. If an employee would exceed their limit, they are said to be "Stressed" and won't be recommended. You can see how this works here. You may either override the warning, change the employee's stress profile, or assign another employee.